Welcome to My Present Planner, where getting the wrong present is a thing of the past! Here, you can create a present list filled with whatever you heart desires - for any occasion you can think of! You can add links to your favourite shops and then email your friends and family to let them know what you would like. 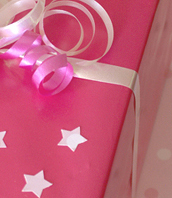 They in turn can access your list and choose a present for you at their leisure. Once a present has been selected, the list will be automatically updated to show that the item has been bought. 'What's so good about that? ', I hear you say... Well, this means you'll never get a duplicated present again - great! Once you have created a list, it's easy to amend as many times as you need. Then send out reminder emails, 'Thank you' notes and general emails to friends and family. There's even a handy address book which store's your email addresses so there's no need to keep typing them in. My Present Planner is a great way for larger families to buy presents for each other - it’s easy to use and takes the hassle out of shopping. You can even print the lists off to take shopping with you. It's also a handy way to produce a list in advance of an event so that you can add or delete items as and when you think of them. Don't just use this service for Christmas and birthdays! You can create lists for anniversarys, hen nights, christenings - in fact, any occasion at all.Why not register with us today and we can save all your details online right away. You can register and use this website completely free! There's no charge for signing up, creating lists or sending emails. We hope you find this website valuable and helpful - and that from the moment you join our club you need never have a ‘bad present day’ again!